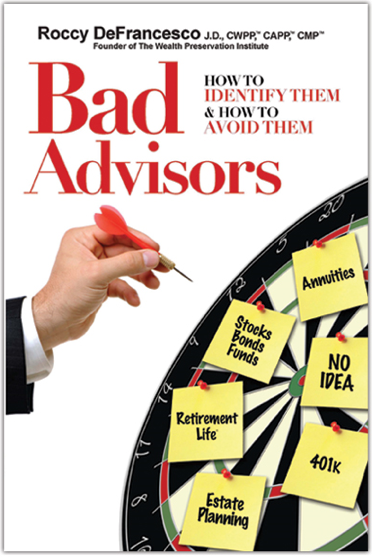 STOP WONDERING IF YOU HAVE BAD ADVISORS! Learn from six-time author insider secrets the financial services industry don’t want you to know. Identify financial planners who are forbidden by their B/Ds from giving clients the *best* advice! Identify insurance agents who are forbidden from selling the “best” products in the marketplace! Learn why it’s impossible for fee-only advisors to provide objective advice! Identify various sales systems designed to help advisors sell products/services that are NOT in their clients’ best interest! Identify classic errors attorneys make that can cost clients hundreds of thousands of dollars! Understand why most CPAs do NOT provide pro-active advice to reduce taxes! Learn about the sales incentives many advisors are offered that often times taints their advice!